Do you have a love of singing for the Lord? Lend us your voice and become a part of ST. JUSTIN’S ADULT OR CHILDREN’S CHOIRS NO EXPERIENCE NECESSARY! REQUIREMENT: A LOVE OF SINGING FOR THE LORD! 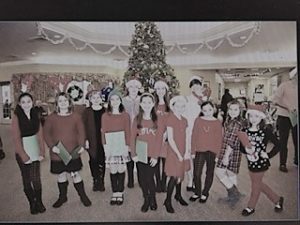 St. Justin’s Music Ministry provides beauty, joy, comfort, and inspiration for our liturgies and festive parish celebrations through the musical gifts, generosity and commitment of our members. Music Ministry Outreach includes Christmas Carols at area nursing homes in July and December. If you can carry a tune, want to learn, and have a desire to sing with us we are in need of your voice! A Special Note to Parents—if your child has expressed an interest in music or singing please do not hesitate to contact me. St. Justin Music Ministry Mission Statement: WE ARE CALLED:*TO connect people to each other and to God, through the gift of music,*TO glorify God through a unique ministry of music, which draws people into a new and deeper relationship with Him,*TO be faithful stewards of St. Justin, accountable to God for responsibly sharing our time, talents and treasures,*TO build our lives in the image of Christ through worship, prayer and song!